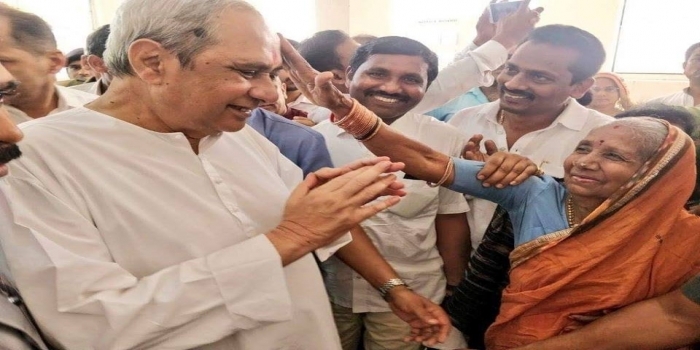 Odisha Chief Minister and Biju Janata Dal president Naveen Patnaik filed his nomination papers for Hinjili Assembly constituency in his home district Ganjam and on Wednesday. This is the fifth consecutive time that the Biju Janata Dal (BJD) president is seeking election from Hinjili. To demonstrate the BJD’s commitment to social and political emancipation of women, Pramila Bisoi, a women self-help group activist, accompanied Mr. Patnaik when he submitted his nomination papers at the district headquarters town, Chhatrapur. Mrs. Bisoi is the BJD’s candidate for Aska parliamentary constituency. Since last 18 years, Mission Shakti programme launched by the CM has achieved immense growth and spread, and have successfully empowered the women of the rural areas. It is nothing sort of a silent revolution in Odisha’s political history. In this election Naveen Patnaik is confident of receiving the support and faith of women folks in Odisha. Most senior leaders of Ganjam district were present at Chhatrapur along with a huge crowd of BJD supporters. The crowd included large number of women, who chanted slogans in favour of the Chief Minister. But the gesture which caught everybody’s attention was when tribal agriculturist Mrs. Pramila Bisoi raised her hand to bless CM Naveen Patnaik which brought a smile in everybody’s face and also reminded all readers of another previous moment when centenarian S.Thimmakka affectionately touched the President Ram Nath Kovind’s forehead to bless him with a smile on her face as he asked her to face the camera after conferring her with Padma Shri at the Rastrapati Bhavan. Patnaik, who would contest from two seats for the first time, has also been the party nominee for Bijepur. After Mr. Patnaik’s nomination, State Minister Usha Devi filed her nomination papers for Chikiti Assembly segment in Ganjam district.